Pssssssst! Did you see the cover of GAIA, Karen Ann Hopkins' second installment in The Wings of War series. Isn't it gorgeous?! I can't make up my mind on which cover I love most! 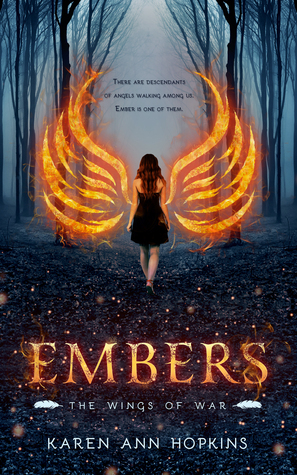 Embers is an epic paranormal adventure/romance about a seventeen year old girl who discovers that she's immune to fire and any other injury when she’s in a horrific car crash that kills her parents. Following a violent episode with her aunt's boyfriend, Ember flees Ohio to live with an old relative in the Smoky Mountains of Tennessee. 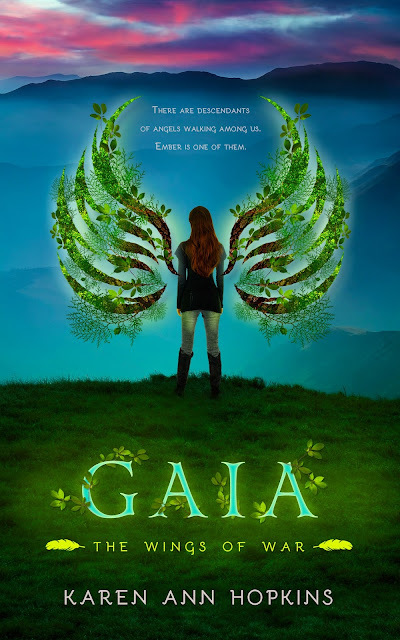 Ember's exuberance at escaping a bad home life soon turns to trepidation when she learns that she's a Watcher, a descendant of angels. While Ember is instructed about her heritage and the powers that go along with it, she strikes up friendships with two teenagers who live in a frightening walled compound in the forest. Inexplicitly drawn to one of the young men in particular, an impossible romance develops. But it's cut short when Ember discovers that her new friends are fighting on the opposite side of a war that's been raging between two factions of Watchers for thousands of years. When the compound’s inhabitants threaten the townspeople, Ember takes action, sealing her fate in the ancient battle of good versus evil, and the grayness in between. Ember is up to the challenge, until she realizes that she isn’t only fighting for the lives of the locals and the souls of her new friends. She may be one of the few champions willing to make a stand for all of mankind as the rapture approaches and the end of days begin. Karen Ann Hopkins resides in northern Kentucky with her family on a farm that boasts a menagerie of horses, goats, peacocks, chickens, ducks, rabbits, dogs and cats. Karen's main job is home schooling the kids, but she finds time to give riding lessons, coach a youth equestrian drill team, and of course, write. She was inspired to create her first book, Temptation, by the Amish community she lived in. The experiential knowledge she gained through her interactions with her neighbors drove her to create the story of the star-crossed lovers, Rose and Noah. Karen grew up about a mile from Lake Ontario in Upstate New York. She was bitten by the horse bug at the age of five, and after diligently taking riding lessons for several years, was rewarded with her first horse at the age of eleven. The feisty horse's name was Lady, a Quarter Horse-Thoroughbred cross, who became Karen's steadfast companion. Through the years, the constant force in her life was horses. Eventually, she found her place as a riding instructor herself. Before accepting her fate in the barnyard, she worked a short stint as a paralegal, traveled abroad, and guided tourists on horseback riding tours in the Smoky Mountains of Tennessee. Karen is currently working on her Amish mystery series, Serenity's Plain Secrets, along with the YA paranormal/fantasy series, The Wings of War. Karen is also excited to announce the Temptation series has been optioned for TV by Pilgrim Studios and is available on Audible.